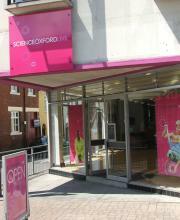 In the autumn of 2011 the Oxford Cafe Scientifique moved to a new venue at Science Oxford Live. With good transport connections and the advantage of not interrupting a commercial coffee-shop, the Cafe Sci has continued to flourish in its new home. Science Oxford Live is based at 1-5 London Place, Oxford, OX4 1BD. Telephone 01865-810000 during office hours. The building is on the corner of Cave Street and St Clement's, at the foot of Headington Hill (right beside the set of traffic lights at the entrance to Morrell Avenue). The centre is set back a bit from the pavement and road, and features the Science Oxford reception and displays of their exhibitions and events. See http://bit.ly/oxmQLm on Google Maps for street plans, photos, and to work out driving directions. Cycling - SO Live on St Clement's is easily reachable from many areas within and outside Oxford by bike. There is plenty of space for bikes to be locked up either in front of the centre, or on Cave Street beside it. Driving - see map and postcode above. There is very limited car parking space behind SO Live itself which is not publicly available: disabled and limited mobility audience members please ring SO on 01865-810000 during the daytime to discuss access. Public car park - The St Clement's car park behind the Angel and Greyhound pub (postcode OX4 1AB) has reasonable spaces during the evenings and is a short walk from the centre. The carpark is free after 8pm at night, but before that pay and display charges are moderate: 1 hour �20, 1-2 hrs �00, 2-3 hours �00 and more for extended periods. Private car park - Another option is to park behind the Tesco Metro on Cowley Road (postcode OX4 1UT), and to walk out of the back and down one of the back streets to Morrell Avenue. This is a longer walk than from the St Clements' car park but has fractionally lower pay-and-display charges. On-road car parking - If you drive up Morrell Avenue from St Clement's, you find that there are quite a few on-road parking spaces in short stretches going up the Avenue (the first is on the right-hand side, after which they vary). Many of these allow free non-residents' parking from 6:30pm onwards: check each sign for details. Please bear in mind that Morrell Avenue is a bus route, so do not park outside designated areas. Most of the side-streets off St Clement's and Morrell Avenue have at most 1-2 non-residential parking spaces and may be patrolled by wardens even in the evening. Bus routes - St Clement's is served by the following bus routes: Oxford Bus Company 4 (new route), 8, 9, 13, 23, X3, X13; BrookesBus U1; Stagecoach 8 and 9; plus the Thornhill and Seacourt 400 Park & Ride services (click here for information) the Airline buses, the Tube, and the Oxford Espress. The stops on both sides are roughly mid-way along St Clement's, ie a couple of minutes' walk from SOLive. It is also possible to use buses to Cowley Road, and get off near Dawson St, Jeune St or Rectory Rd, then to walk through. There is a pedestrian/cycle passegeway which connects Alma Place and Tyndale Road to St Clement's. Visitors coming in on buses which stop at the High Street before going towards Iffley or Abingdon could get off at Queen's Lane, from where it is a 10-12 minute walk to SOLive. Train - The Oxford Bus Company route 4 bus connects the train station and Science Oxford by a service of less than 15 minutes at off-peak times. Join the bus at Frideswide Square (outside the railway station) and leave it on St Clements before it turns up Morrell Avenue. It is then a brief walk to the SO centre. The Thornhill Park & Ride bus also runs from the railway station bus stop at St Frideswide, and may be quicker but more expensive than the route 4 bus at busy times. There is disabled/blue badge parking behind Science Oxford: please call in advance during office hours to arrange it. Access to the upper room is straightforward via a lift or stairs. The building has an induction loop system: ask on entry. Toilets are located on all floors, and the usual Cafe Sci cloakroom option will be provided to avoid cluttering the floor of the forum with bags and coats. The new-look Oxford Cafe Scientifique, sponsored by OBN will provide free nibbles and drinks at every Cafe. Due to OBN support we should in future be able to offer a slightly wider range of snacks, non-alcoholic drinks and more glasses of 'emergency wine'. However as usual we make no guarantee that there will be any wine left by the time you arrive, so bring your own if you want to be sure, or have a preference for type. if you don't fancy a walk into the city centre, there are a large number of places to go on after the Cafe in the St Clement's and Cowley Road area, many at reasonable prices. Visit the Daily Information food page for suggestions of both types. We can particularly recommend the Cafe Coco, Kasbar, Moya, Qumins, many of the small Indian restaurants on Cowley Road, the Thai Orchid, George and Delila's for bagels and icecream, Fishers for freshwater fish and seafood, the Bullingdon Arms for live music, the Angel and Greyhound pub if you like a quiet pint and playing board games, Mario & Mario for fresh pizza and pasta, and La Cucina beside the St Clement's car park is a reasonable standard Italian. There are many other good places to try in the area. There is also the option to go on to a late screening at the Ultimate Picture Palace, a short walk away on Jeune Street, if they are showing anything on Cafe nights. The Cafe is usually finished by 9pm, their start time for the late features.